Start very early. Read to them from the time they are babies. Let them touch the book and turn the pages themselves. You probably will find that they prefer certain books over others. If that is the case, seek out books like the ones they like, and read those. Let them see you reading. Children – especially younger children – like to do what they see other people doing. If you read often in front of them, they probably will be more interested in reading too. Build outings around books. Take them to the library and to bookstores. Bring books with you when you travel or when you go somewhere you know there will be downtime. Be aware of their choices. Even from a fairly young age, many children have a favorite genre. Perhaps they like books about animals or fairies or cowboys or dinosaurs. Whatever their interest, use that as a way to draw them into reading and to encourage them to keep reading as they get older. Provide a time and place for reading. You probably read to them before bed, but don’t stop there. For example, while you are making dinner, encourage them to sit in a comfortable chair and read, allowing them to discuss what they are reading with you while you work. Or set aside time for both of you to curl up in a chair and read. Encourage, but don’t push. Many children lose interest in reading when their ability to understand and imagine things outstrips their ability to read on their own. If this is the case, help them get past that. 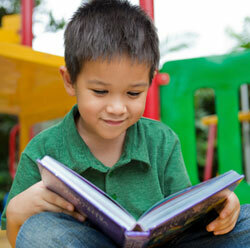 You can read together, maybe alternating pages, until the child has more skill and confidence. Similarly, talk to them about what they are reading. Ask them what is going on in their books. Look for series of books. Finding a series you really like can encourage readers of any age. There are all kinds of series of children’s books, so help your child or grandchild find one that interests him or her. Don’t despair. There are many reasons a child might not embrace reading wholeheartedly. You can’t make children love reading. But you can help them to explore and respect it. And who knows where that might lead someday?